Got up on Sunday morning full of excitement. It seemed ages since I last went to Berlin in April. But now the day had arrived. juice. My thoughts were already on a certain enclosure..
so convenient. And then in a short time I am through the zoo gates and moving quickly. No signs now pointing to Knut, but I know the way blindfold. Maueschen had a Mrs Robinson effect I wonder briefly, but remember that Knut's main love apart from TD is croissants!). then realise this is a German internal affair. But one with world implications! I just have time to greet the Gang of 4 in their large enclosure. Too late, all I can see is tail stumps. Katyusha at one door, Nancy at the other. Lars as usual has placed himself on a rock. Only Tosca seems to respond briefly to her name, standing as if for one of her Staatszirkus performances. e-mail address on this blog. Back to my coffee here at Friedrichstrasse. Its 8.30 and I am looking forward to another Knutday! After writing my first entry it was off to the Zoo. When I arrived at about 10 oclock, Knut had already had his morning swim and was wearing his multi-coloured look. This was a mixture of green algae, black mud and sand. Knut manages to turn this into a beautiful natural camouflage. If all Polar Bears have this technique they may adapt to Global Warming faster than we think! I met some nice people as usual. A lady from Hamburg brought me up to date on Fanny, now that her daughter Viktoria is in Bremerhaven. Fanny is now a very old lady and has to have lots of quiet time, either inside her cave or in the shade. 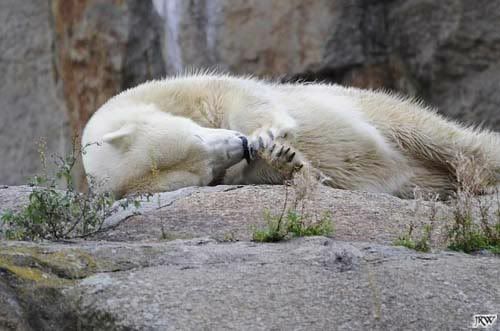 I also learned more about Knut's daily routine, which seems to be well set. He still misses Thomas D a lot when he is not around, although I found Knut to be doing his own thing very purposefully. Back again in the afternoon to see Knut get his meal at 2.30. Herr Roebke is very efficient, but Knut still knows how to get his own way. The opening Croissant is taken and eaten quickly. Any green or carrots are left for later. 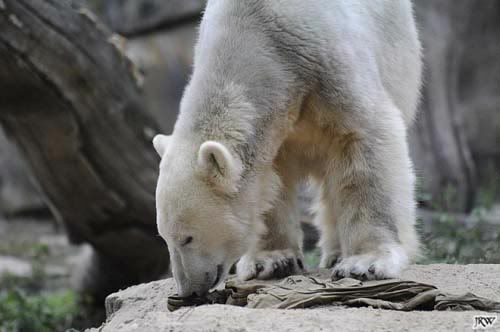 Unlike Lars, Knut does not strain himself to catch his food, but flops in leisurely to get it. He loves meat and grapes. Later I watched the bears waiting for their afternoon food. All 4 of the Gang had decided the day was too hot and were in the lying down mode (Katyusha and Nancy again right in the doorways). Thanks for the kind comments from yestrday. 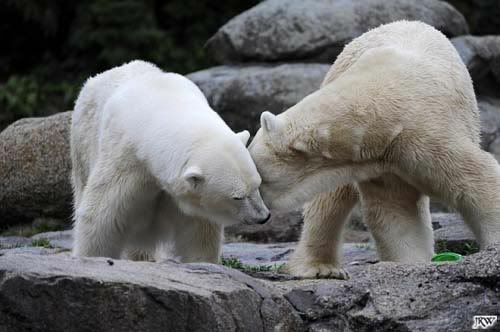 I do indeed blow kisses to Knut and call his name from time to time. I will do this for all. What impresses me is that he is nearly an adult bear but the face, the eyes and ears are still those of Knut! Already Wednesday! I arrived promptly at Knut's enclosure as the Zoo opened at 0900. However, even the presence of me eating a couple of meat filled rolls and a blueberry donut did not rouse Knut from a deep sleep, curled up on his usual mound of sand. Two reasons: It thundered last night in Berlin. Knut hates that and so got little sleep. No wonder the bear is tired. Also he knows that his papa is back today! The gang of 4 were not quite so thrilled, as Herr D kept them waiting for a few minutes. Tosca in particular seemed quite annoyed and probably noted that stars have rights, noone does this to Barbra Streisand or Madonna..
Herr D made up for this with his usual superb throws (a natural football star?) Lars was in his usual tall standing up mode, but was beaten to a piece of meat by Nancy. Even Katyusha was making her moves. Nancy giving Lars a piece of her mind! I was then told that the Malayan bears (Sun bears in English) would also get the Herr D treatment. Sure enough at 1045 he was laying out coconuts, apples, carrots, bread rolls in a tree trunk and stuffing a hanging log with banana flesh. Ernst had had to come all the way down from a tree top for this. His mother was the best coconut opener, the two men did not seem to have the same skill, though they caught up later. Back to Knut at 1115. He was having a short stroll and reared up on his hind legs to try and catch some branches. Then he returned to lying in the entrance of his hole. Now I must try and catch some other Zoo stars. But first some lunch. I forgot to mention the tiger group in the Tierpark. Darius has produced a new version of himself: Antares. The family all live together. My last morning sitting here watching the Commuters pass by to work. It is so warm compared with England that I have treated myself to an iced coffee. But first to business. After a light lunch I returned to the Knutzone. Those of you who read German will have seen the reports above of Knut's great day, but I will do my stuff anyhow. Knut was waiting for his feed, but already seemed a lot more excited and happy. So much so that when Herr D suddenly appeared from above the enclosure and threw down a large bone with meat and fat on, Knut could not believe his luck. Torn between trying to find where his papa was and a piece of meat, he decided to look for the meat. Knut is already aware of the dangers posed by his rocky banked enclosure. Rather than diving into the water in front of the crowd he took a safer side route and soon had the bone. Knut has allocated a special piece of flat rock by the water as his eating board. He ate the meat off the bone with great delicacy and showed his growing bite power. I can't eat Daddy's pants but I love them anyway! Herr D's return was greeted by much approval from the large crowd, but Knut seemed to reckon that he was not getting on with the important bit. Some carrots and green stuff flew. Knut was not falling for that one, even from his papa. Only when a piece of meat or fish came his way did he dive, just like his father Lars. 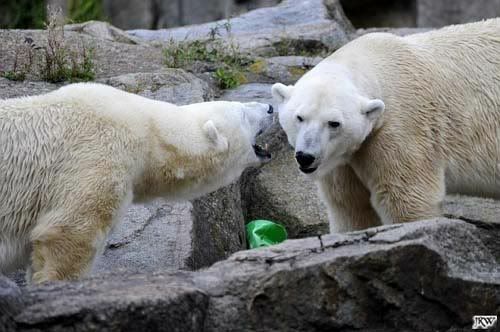 Grapes are a Knut treat from when he was little (Vilma the Nberg Polar bear sent back to Rostock was also welcomed home by a grape treat). However, the best had been arranged by the Knuipe team with Herr D in the morning. He received a beautiful salmon, its red flesh glowing with health. Knut made short work of this! Afterwards Herr D was surrounded by the usual admirers. A young woman asked for his autograph on a card. He duly signed. She then looked at the signature and asked "Yes, and who are you please?" With a wide grin, Herr D gave his name. The rest of a lovely afternoon was spent between Knut and the gang of 4 in the sunshine. Knut's appearances were as ever special, but I especially impressed by his use of his stick of wood to scratch himself by manipulating it with his paw. Berlin Zoo seem to be unsure what to do with Knut, but I think they and others are already missing a golden opportunity to study his behaviour. I hope some professionals are taking advantage of this and other sites to do so, rather than just dismissing Knut as a media hype. He should really be filmed round the clock . Finally, the gang of 4 were enjoying a lazy afternoon in the sun. They are a fantastic team. Lars is a nice and handsome bear. Tosca a worthy and pretty mate. Nancy is her great rival and a similar looking bear to Tosca, though perhaps not as pretty. 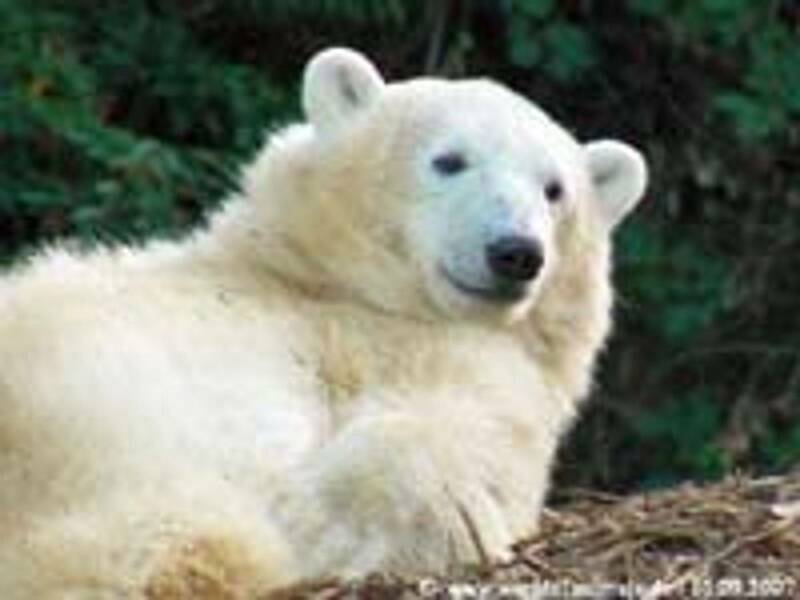 However, Lars and I both have a soft spot for Katyusha, who is a bit fat and lazy, but seems a real Polar Bear girl (Is this Flocke in some years time I wonder? Or maybe she will be even sweeter than Lara). Well that is my last report from Friedrichstrasse. I will try and round up at lunchtime. Knut began his day with a workout in this private pool. After the excitement of TD's return he needed to stretch himself before the public arrived. Once the usual crowds turned up he would be safely curled up on his sand bed. Knut's camouflage of sand, green and some xtra mud pleased him. 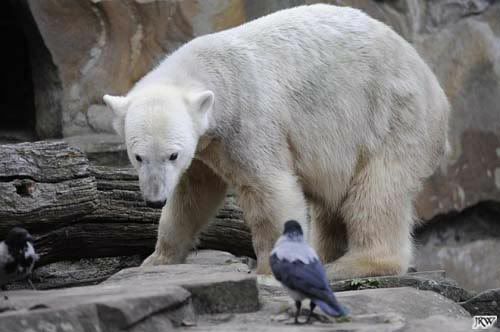 All this nonsense about white bears being helpless away from the snow. Thunder is another matter. Lars, lying stretched out in the sun can still teach Knut a few things about presence. Tosca is having to watch out for Nancy, who has taken her place next to Lars. Katyusha, the biggest girl stands like a professional wild ice bear. She has heard some people call her "Fat" and is not impressed. Can they stand dead still in the same place waiting for their food and then suddenly dive for it. Herr D arrives with an assistant. He works the bears as usual. The big surprise is Tosca. Tosca does not give way to Lars when he tries to assume his nomal best place on the rock. Almost saying that she is still top girl, she stays, and Lars lets her. After the Gang at 1045 there is the bonus of the Sunbears (Malayan bears). Herr D is working hard today and has brought a bottle of liquid honey. The bears are let out. Booniphol ignores the honey and grabs his favourite fruits from the tree. Maika is covered in honey drips (Paris Hilton take note, this could be an interesting party trick!). Ernst is in the thick of the action. After a brief stop to update the blog diary I decided to have my last meal at the Zoo restaurant. I cannot resist Currywurst and chips, although it makes me look like Knut on his first birthday! I sat outside in the bright sunshine and prepared for what proved to be an eventful afternoon. My first visit was to the souvenir shop to pick up my large plush bear, I chose her because she stands just like Katyusha. I then went to see the real Katyusha. She was as usual staying near the door and looking pleased with herself. The other bears were spread out and I was able to say my farewell to each in turn. Back at Knut's enclosure. Knut was doing some serious diving by the wall. Again and again he was diving to bring up something important. He showed how powerful the bear has become, as he can do this hard exercise continuously for over half an hour before resting. Herr D appeared briefly to throw Knut a bright yellow ball and a piece of meat. Knut was more interested at first in working out where his papa was, but then decided that the stomach needed a workout too. Two other keepers were at the glass wall and they were kind enough to listen to my range of questions and comments. Herr D then appeared and put Knut through his paces. When a carrot or piece of green was thrown Knut looked at it and made it clear that he would only jump for a piece of meat or fish. Bananas, however, do tempt him. Knut is a much quieter bear these days, and like his father will only omit a soft bleating growl (Klageruf) when he is not happy. Knut's real treat for the day was a huge bone with meat on, a donation from? Saying my goodbyes I made for the airport on the X9 bus. This is such an easy and pleasant journey compared with the underground to Heathrow or the planned S Bahn link to the new Berlin airport. Change does not equal progress! However, the BA flight was on time and I was soon sitting on board the Airbus. A young woman in front was making a great fuss about flying and started waving her arms and shouting, also pressing the bell for the steward, who tried to calm her. I tried to help by talking to her, but was surprised to learn that she was a business woman and flew all the time. I decided to take Katyusha out of the overhead locker and after eating a brief meal and supping two small bottles of beaujolais I sat with her on my lap all the way into Heathrow. Curiously the young woman made no further fuss or attempts to be sick etc. Perhaps my putting an airline sickbag from time to time on Katyusha's nose had something to do with it. The BA staff seemd relieved that no further silly noises were coming from the young woman and the female crew chief even patted Katyusha. Shame I cannot try the same with the real bear. I was lucky and got the bus back to Oxford quickly as well. Katyusha is now standing at home watching the TV in case a seal appears! Many thanks to all who I met and have commented so kindly on this blog.